The Mass in E flat was most likely composed for the 1804 Marienfest in Eisenstadt, an annual event celebrated with great pomp and splendor to honor the Fürstin Maria's name day, usually on the weekend following the Mariä Geburt observance (September 8). For the Marienfest, the Fürst usually hosted a banquet, a ball, and a concert, in addition to a military parade and fireworks. He also commissioned a new Mass each year (the late masses of Haydn and the Mass in C of Beethoven owe their existence to the Marienfest). The recently-appointed Hummel would have been a logical choice for such a commission in 1804, the Marienfest providing a perfect opportunity to showcase his abilities as a composer. A review of the Mass in E flat in an 1820 issue of the Allgemeine Musikalische Zeitung, Leipzig, lauded the work as "exquisite" and "composed in the spirit and manner of J. Haydn, yet without sacrificing originality". 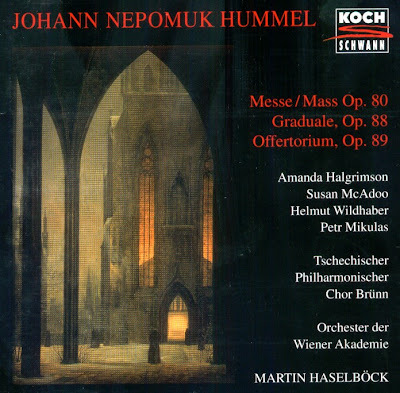 Hummel's Mass was widely performed in the composer's days; the work was published twice in Vienna (c.1819 and c. 1830), in Paris (1830) and late, in London (c. 1845 and c. 1874). Unfortunately the mass had fallen into disuse by the end of the century (maybe forgotten ? ), and it was not until 1993 that the first modern edition, published by Doblinger Verlag, Vienna, was used for this recording. Two outstanding examples of Hummel's smaller symphonic sacred works composed for the Esterhazys are the Graduale Quod, quod in orbe and the Offertorium Alma Virgo, both dating from 1805. Like the Mass in E flat, both works were published in Vienna and in London and both were widely performed until the turn of the century. The first modern editions of these two pieces, after more than 100 years, were published in 1995 by Cantate Music Press (USA). The CD was released by Koch Schwann, 1996, (DDD). Koch Schwann 3-1779-2.